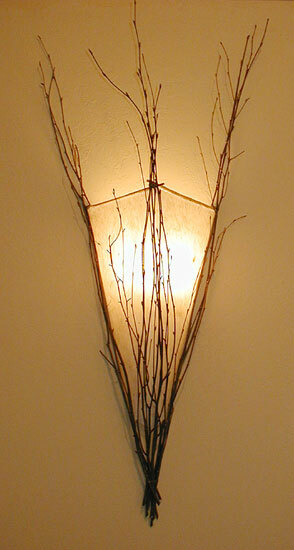 Branchy Birch Twigs frame a tall, narrow triangular-shaped sconce that juts out like the bow of a ship! Shown here made with a natural, off-white paper; other colors available. 10" wide across top of shade portion, 15" tall (shade portion) and overall 36" tall with twigs. Holds one candelabra bulb, 40 watts max.